Bastille Day, July 14, is France's biggest national holiday, called "La Fête Nationale." For US readers, it is equivalent to our July 4th, and that similarity can trigger connections with independence days across all the nations of the world. For French citizens, it commemorates the storming of the Bastille fortress in 1789, which marked the start of the French Revolution. 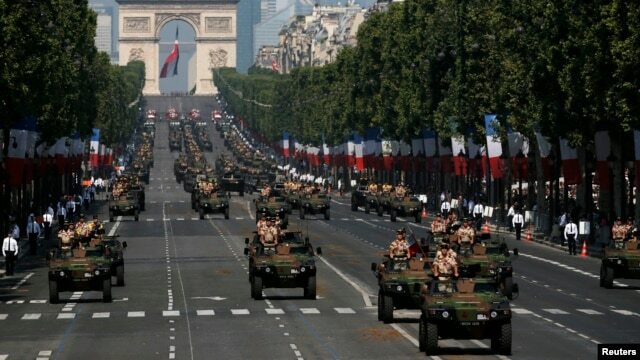 There is typically a large military parade. This year, according to a Voice of America article, close to 5,000 troops, including U.N. soldiers in blue berets and servicemen from 13 African countries marched past the presidential stage, led by a Malian officer, drawing attention to France's role in liberating the African country's north from Islamist and other insurgent groups. Teatree's musing pulls him back to the late 1700's when both the US, and France established their independence in different circumstances - just two countries that come to mind, but reflecting perhaps some growth in terms of governance. Just after the Second World War, there was a spate of new independent countries (India leading the way), from empires exhausted and financially drained by two wars in 20 years. In the early 1960s, there was another surge, this time centered in Africa, where new African nations from former colonial status, though their boundaries continue to bedevil their development. The next surge that comes to mind was in 1989-1991 when independent nations emerged from their puppet-like status under the collapsing Soviet Union.